via Many-spin quantum dynamics during cross polarization in 8CB | Browse – Journal of Chemical Physics. We analyze theoretically and experimentally the quantum dynamics of a three-spin-1/2 system during cross polarization (CP). Our analysis takes into account a Hamiltonian behavior for a carbon 13C coupled to two protons 1H while the coupling to a spin bath is treated in the fast fluctuation approximation. This model is applied to the methylene and biphenyl groups of the smectic and nematic phases of the liquid crystal 4-n-octyl-4′-cyanobiphenyl (8CB). Experimental data from standard CP, combined with our theoretical results, allow us to separate the homonuclear 1H–1H and heteronuclear 1H–13C residual dipolar couplings. These values are in good agreement with those obtained by using a combination of CP under Lee–Goldburg conditions and standard CP data. A well differentiated relaxation behavior among the two phases seems to indicate that while the extreme narrowing approximation is appropriate for the nematic phase, the description of the smectic phase requires consideration of the slow-motion limit. © 2003 American Institute of Physics. 13C polarization as a function of contact time tc for aromatic and aliphatic carbons in a standard CP experiment at 300 K smectic phase. 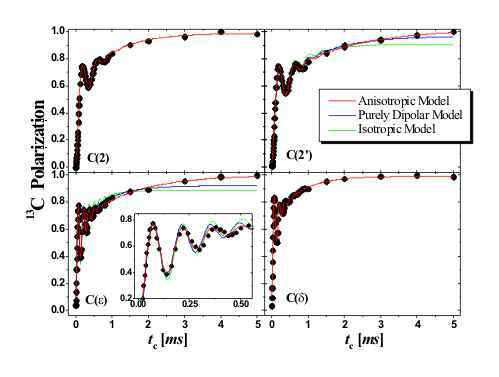 Fittings of the experimental data to the anisotropic, isotropic, and purely dipolar models described in the text.